Il-Qawma Tat-Tritoni (The Rise of the Tritons) was one of the major highlights of the Valletta 2018 Opening Week, which inaugurated the start of the Maltese Islands’ tenure as the European Capital of Culture for the year 2018. 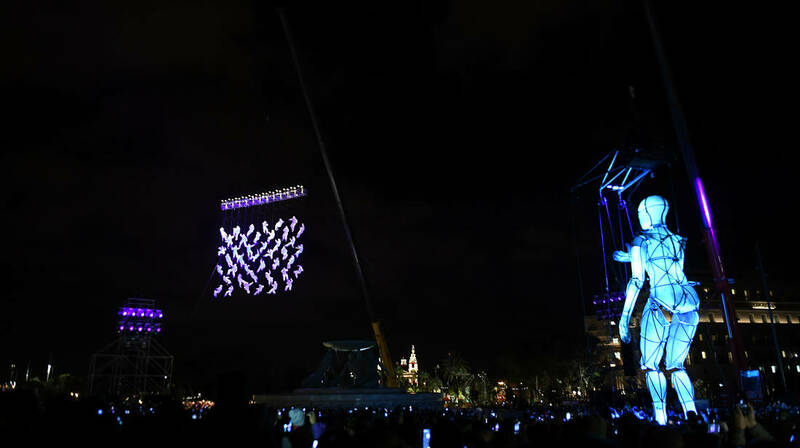 The large-scale show by the theatrical group La Fura dels Baus, directed by Pep Gatell, celebrated the newly-restored Triton Fountain with breath-taking aerobatic choreography, puppetry, lighting, and ambient soundscape. The whole spectacle was an interactive experience that required the collaboration of everyone present, blurring the line between the audience and actors thanks to the company’s signature style, which makes use of urban theatre and unusual settings. For one magical night, the open space surrounding the newly-restored Triton Fountain became a land where giants were built, a land that received a visit from an interstellar ship travelling in search of its memories. Framing the scenarios were whimsical details, such as a fountain that doesn’t sprout, flying objects, and fire and torches. Meanwhile, amidst the crowd, a colossal marionette moved its limbs, sometimes kneeling, sometimes walking, to the cues of the puppet masters above. And above the Triton Fountain itself, a living net of sixty local acrobats trained by La Fura dels Baus were suspended over the monument in a display of skill, strength, and grace. Il-Qawma Tat-Tritoni provided an immersive, open-air theatrical experience unlike anything ever seen on the Islands, as well as a platform for fresh local talent and meaningful international collaboration and exchange.